The big libertarian pow wow was a who’s who in the freedom movement: Steve Forbes, Senator Rand Paul, John Stossel, Congressman Justin Amass, Charles Murray, Grover Norquist, Dinesh D’Souza, John Allison, Gene Epstein, Nick Gillespie, Art Laffer, Steve Moore, Randy Barnett, Lee Edwards, Dan Mitchell, Matt Kibbe, Wayne Allyn Root, Rusty Humphries, Jenny Beth Martin, Jim Rogers, Yaron Brook, Tom Palmer, David and Mary Theroux, Lawrence Reed, Joseph and Elizabeth Farah, David Nott, David Boaz, George Gilder, Jeff Tucker, Fred Smith, John Browne, Alex Green, Anthony Gregory, Lisa Kennedy, Doug Casey, Matt Welch, Ken Schoolland, Jon Utley, Tim Nash, Larry Greenfield, Daniel McCarthy, Mary Ruwart, John Goodman, Ben Powell, Barbara Kohm, Richard Rahn, Roberto Salinas, Brian Calle, Bill Norton, Alexander McCorbin, Michael Shermer, Larry Pratt, Peter Boettke, Jim Gwartney, Max Borders, Steven Horwitz, Gerry O’Driscoll, Doug French, Floyd Brown, the list goes on and on. Attendees came from around the world – North and South America, Europe, Asia, the Middle East, Africa and Australia. We even had a delegation from Poland. Every day was a highlight, starting with the Opening Ceremonies with speakers Steve Forbes, Dinesh D’Souza, and Wayne Allyn Root, and former Las Vegas Mayor Oscar Goodman (after his speech, all 200 copies of his entertaining book “Being Oscar” were sold). Keith Fitz-Gerald stole the show by appearing as Romulus Augustus, the last emperor of the Roman Empire, escorted by two Roman soldiers. He warned the audience not to make the same mistakes Rome did. Roman Emperor Romulus (Keith Fitz-Gerald) with FreedomFest producer Mark Skousen, his grandson and some Roman Centurions. After our opening ceremonies, we had our cocktail party in the exhibit hall (“Trade Show for Liberty”) and the electricity and buzz were palpable. You had to be there to experience it. Almost every major free-market think tank and freedom organization was there for what I call “one-stop shopping for liberty”: Cato, Heritage, Reason, Koch, Independent, Heartland, FEE, ISI, FreedomWorks, Eagle, Students for Liberty, ISIL, Pacific Legal Foundation, Americans for Prosperity, Atlas Society, Friedman, Liberty Fund, and the Tea Party Patriots. Many of them had their own “day” at FreedomFest: FEE Day, Reason Day, and ISIL Day. Steve Forbes, our ambassador, expressed the optimism of our attendees when he proclaimed, “The leaders of Rome didn’t have the knowledge and wisdom of our generation. We know what it takes to avoid the mistakes of Rome.” But not everyone agreed. Commodities guru Jim Rogers warned our propensity to spend, tax and inflate would “end badly.” Lawrence Reed, president of the Foundation for Economic Education, gave a keynote speech Thursday morning on “The Fall of Rome and Modern Parallels,” of which there are many. His most memorable line was “government is too big to succeed.” FEE passed out copies of his pamphlet, “Are We Rome?” at the conference. You can obtain a copy here: http://www.fee.org/files/doclib/20130620_FEEAreWeRomeCover1V5.pdf Highly recommended! The big show was sensational. We had 2,500 attendees, including several hundred local residents who came to the John Stossel show on Thursday evening. Comments heard: “15 stars for this year’s FreedomFest……I feel 20 years younger here….You throw the best party in the world…..This is my first FreedomFest; I call it Disneyland for the mind…..You knocked it out of the park.” We had major coverage from the Huffington Post, Bloomberg, C-SPAN, World Net Daily, MSNBC, Orange County Register, and Fox News, plus lots of radio stations. John Stossel taped his Fox Business show at FreedomFest on July 11. It appeared on the Fox Business channel a week later. It was so popular that the Fox executives re-aired it again on Fox News (the #1 cable channel in the country) on Sunday, July 21. There were over 150 sessions, including a dozen debates and panels, and plenty of advice for investors and concerned citizens. This being the 100th anniversary of the 16th amendment (federal income tax), the 17th amendment (direct election of senators), and the creation of the Federal Reserve Bank, we had a variety of panels and debates on taxation, democracy, and sound money. Among the highlights: Steve Moore (Wall Street Journal) insisted that ObamaCare was “unraveling,” because it is causing unemployment. Supply-side guru Art Laffer said that we are witnessing a “big reduction” in government as a percentage of GDP, which is good news. Charles Murray wants to start a “civil disobedience” movement and hopes to raise millions to fund to defend small business people who fight absurd and excessive federal regulations. He’s writing a book on the subject, to appear next year. And Senator Rand Paul gave a keynote address on the growing threat of government surveillance. FreedomFest is a Renaissance gathering, and this year we had several experts on a variety of themes. T. Colin Campbell, the world’s #1 nutritional scientist, spoke on “The Whole Foods Diet: How to Live to 100 Without Getting Cancer, Heart Disease, Diabetes, or a Stroke,” based on his revolutionary work, The China Study. He took the place of John Mackey, co-CEO of Whole Foods Market, who has spoken several times on this subject. Daniel and Hanna Greenberg, founders of the revolutionary Sudbury Valley Schools based in Massachusetts, spoke on “Radical New Ways to Educate.” Their schools have no curriculum, no classes, and no grades – yet their students are some of the top achievers in the country. The mock trial on Friday, July 12, is always fun. We’ve put capitalism, religion, public unions, and Wall Street on trial. This year we put “The Republican Party on Trial” with prosecuting attorney Steve Moore against defending attorney Dinesh D’Souza. The judge was Georgetown law professor Randy Barnett, and the star witnesses were Steve Forbes, Matt Kibbe, Grover Norquist and Floyd Brown. Neither Moore nor D’Souza have ever lost a debate at FreedomFest….Amazingly, the jury voted 6-6, a hung jury! So Moore and D’Souza can still claim undefeated status. Another first at this year’s FreedomFest was the granting of the first Read Book Award, named after Leonard E. Read, founder of the Foundation of Economic Education (FEE). The annual award, which includes a prize of an American eagle one-ounce gold coin, went to George Gilder for his pathbreaking work, Knowledge and Power, published by Regnery. Rich Karlgaard, publisher of Forbes magazine, calls it the most important book of the 21st century. 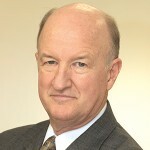 Mark Skousen awards the first Leonard E. Read Book Award to George Gilder. What would freedom be without financial independence? We had dozens of investment breakout sessions. Jim Rogers was the featured investment advisor. He and Donald G. Smith (New York hedge fund manager) were recently listed in a book of top 99 investors of all time – and both were speakers at our conference. The book said that Jim Rogers earned a 45% annual return over the past ten years. He said that “all major industrial countries, from US to Japan, are printing money, an unprecedented event that will end badly.” Don Smith (whose investment company has earned over 15% annualized over the past 30 years) says he likes major gold stocks right now. Anthem Film Festival was a Hit! For more information on the awards and the trailers, go to www.anthemfilmfestival.com. FreedomFest is famous for its debates. This year we had controversies over whether Christianity caused the decline Rome…the cause and cure of violence in America…climate change…tax havens…day trading…Darwinian materialism…and whether investors can beat the market. Doug Casey was his famous irreverent self in the debate over the impact of Christianity on Rome. For me the highlight was my debate with Yaron Brook, president of the Ayn Rand Institute, on “Altruism vs. Selfishness: What is the Ideal in Life and Business?” It was SRO….and the debate so was intense it continued afterwards in the hallway. Didn’t Make it to FreedomFest? Buy the CDs! We encourage everyone to come to FreedomFest. We don’t do a “live streaming” of the 4-day event because we think it’s vital that you come and experience it yourself. But if you couldn’t make it this year, I suggest the next best thing by ordering a copy of all the sessions, panels, and debates. Go to www.miracleofamerica.com, or call 1-866-254-2057. The conference CDs sells for $435. It is always the first thing I do when I come to FreedomFest. By the way, we ran out of silver dollars (our official symbol) at FreedomFest. The US Mint has temporarily suspended sales due to overwhelming demand. FreedomFest is always a lot of fun – meeting people, my daily chess problem, yoga in the mornings, music and dance, the film festival, the debates, etc. We always end the conference with a gala Saturday night banquet, singing our theme song “Freedom and Gold,” enjoying a great dinner, followed by entertainment (this year singer Taylor Hicks and an hilarious juggling act) and the rock ‘n roll dance featuring the creative Pink Flamingos. You could see Jim Rogers and Steve Forbes dancing right up until the end. 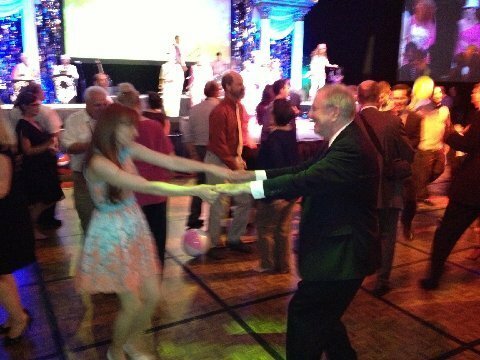 Steve Forbes cuts a rug at the annual FreedomFest Gala Saturday night, along with hundreds of other fantastic FreedomFest attendees. I want to thank everyone involved in making FreedomFest a success this year – Tami Holland, our conference coordinator extraordinaire, for the many hours she spent running the show, and her husband Ron and her many staff members….and to Chip Wood, or master of ceremonies extraordinaire, and to my wife Jo Ann for running the Anthem film festival and helping us make FreedomFest the best it can be. 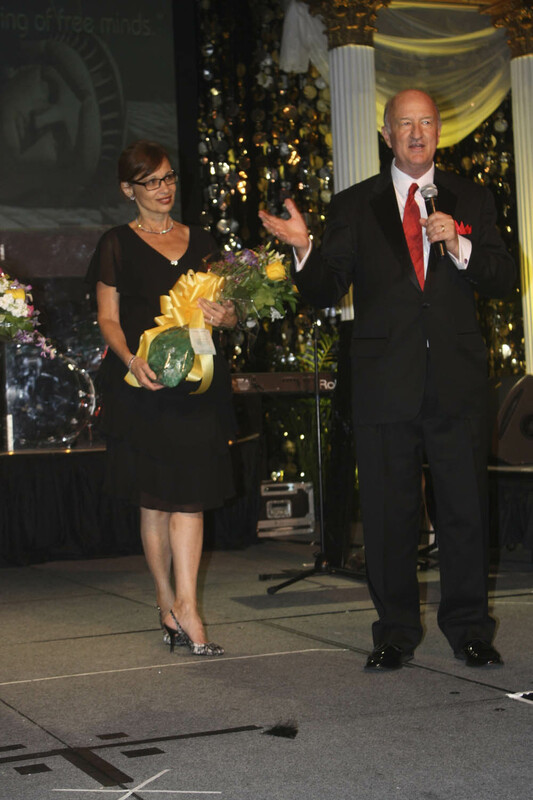 Mark and Jo Ann Skousen at the FreedomFest Gala Saturday night. FreedomFest is held only once a year in July, but we encourage you to stay abreast of upcoming events, speakers, panels and debates by checking our FreedomFest app, Facebook, and Twitter accounts….and I recommend you sign up for our email announcements at www.freedomfest.com. I also hope to see you at the Global Financial Summit at the Atlantis Resort in the Bahamas Feb. 9-12, 2014…and our Asian cruise April 2-15. See “upcoming events” on our website. Hello Mark!! 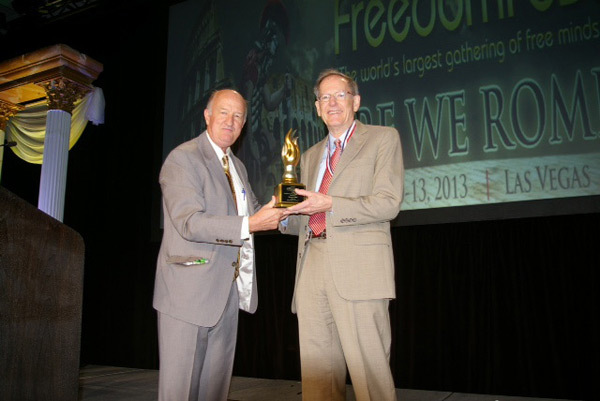 Congratulations on an amazing FreedomFest 2013! I wish I could have been there. Hopefully next year! You and I met at the YSA Conference in Orlando earlier this year, and your seminar was amazing! You may remember me as one of the few long-haired men attending. I think with Big Brother being the theme of next year’s FreedomFest you may find the story of how I encountered your name on the site “Liberty Unbound” and had a prompting to contact you interesting, though it’s not one I want to share online. I will give a take-away message: tor is not useful for anonymity. I hope my letter will reach your desk if I mail it to one of your business addresses. Thank you so much for your great seminar at the YSA Conference! I find that people my age and younger usually don’t seem to understand or have any interest in talking about economics, politics, government, history, or anything at all that’s not light entertainment. I pray that everyone in that room understood and will remember and apply your message. Thanks very much for your letter. I agree with you that most young people could care less about liberty and political/economic issues other than getting a job. It’s a sad commentary on today’s society and our education system. Just look at most TV programs — lots of foul-mouthed reality shows and sports, but hardly any intellectual programming. We need more young people like you interested in the issues that count. I do hope our paths can cross soon, and perhaps you can make next year’s FreedomFest. Here is my personal website, http://www.mskousen.com that you might find of interest. See especially my pamphlet “Persuasion vs. Force,” which President Hinckley endorsed: http://www.mskousen.com/persuasion-vs-force-by-mark-skousen/ It was President Hinckley, among others, who inspired me to produce FreedomFest.